This post has already been read 9552 times! 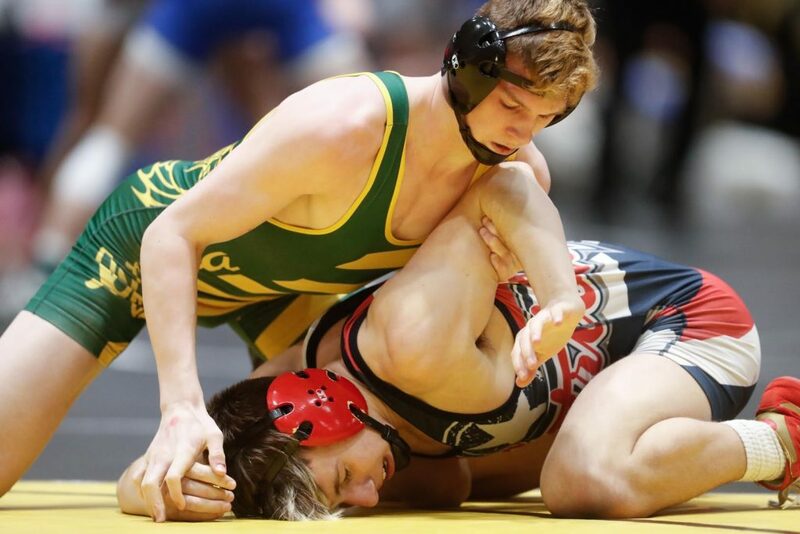 On Saturday, the Health and Sports Center at the University of Nebraska at Kearney was certainly the epicenter for the sport as the top high school wrestling teams from across the state traveled here to compete in the NSAA Dual Wrestling Championships. The event, launched in 2013 and hosted all six years at UNK, brings 3,000 to 4,000 competitors, coaches and fans to Kearney, giving the city and university a chance to shine along with the athletes. Ron Higdon, an assistant director with the Nebraska School Activities Association (NSAA), credited UNK and Kearney Visitors Bureau for going “over and above” while helping get the event off the ground. 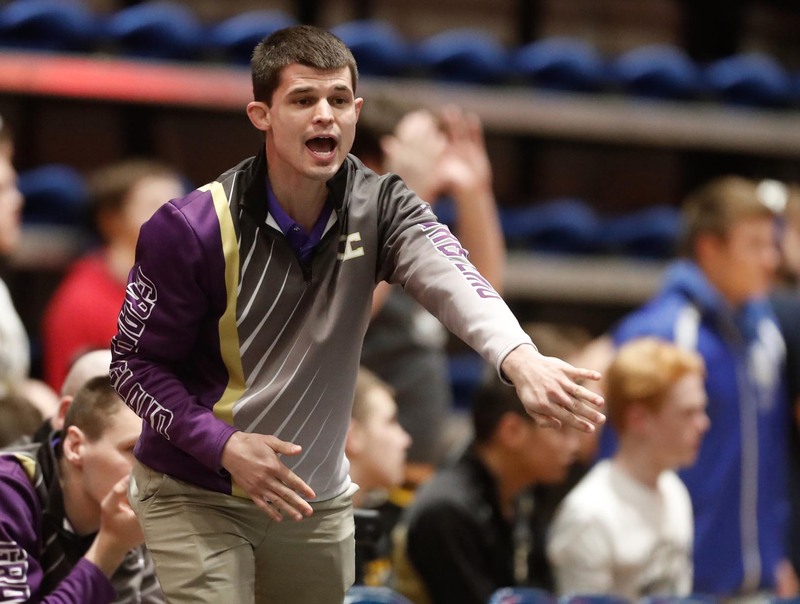 Kearney’s central location is ideal for the 32 teams traveling from across the state for the tournament, he said, and the Health and Sports Center is a great wrestling venue. “In all, very positive comments from the coaches and fans,” Higdon said of UNK as a host site. Lincoln East co-head coach Keenan McCurdy agrees. McCurdy, who wrestled for UNK from 2004-09, called the university a “great” location for the event. 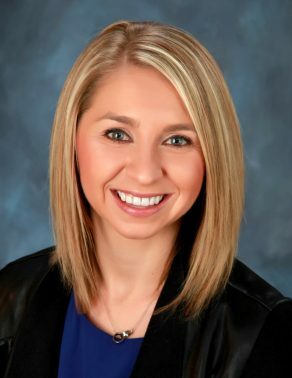 “It’s fun for me, kind of nostalgic a little bit,” said McCurdy, a two-time All-American for the Lopers and member of the 2008 national championship team and national runner-up squads in 2006 and 2007. Between duals on Saturday, McCurdy and other Lincoln East coaches, including former UNK wrestler Jeff Rutledge, took a quick tour of the Health and Sports Center to check out improvements made in recent years. 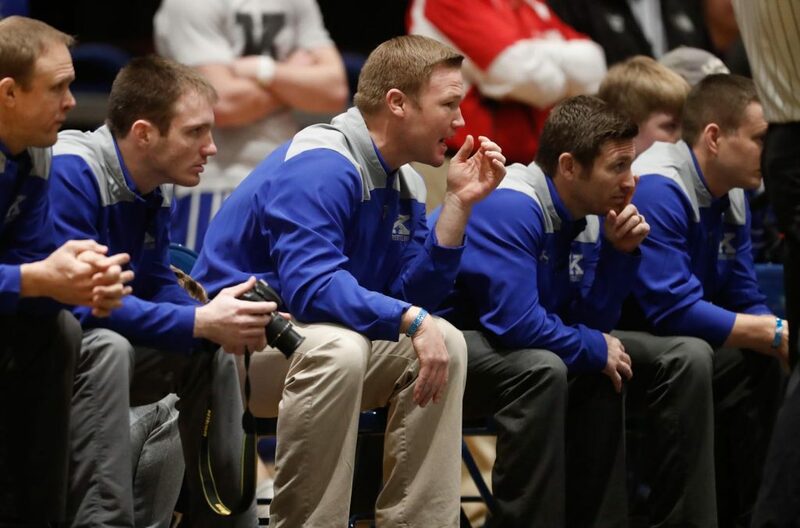 They were among several coaches with UNK ties who brought their teams to the dual championships. Keiswetter, a state champion at Kearney High in 2000 and three-time All-American at UNK, also took note of the changes since his time as a Loper, including the banners representing the university’s three wrestling national championships and five national runner-up performances. 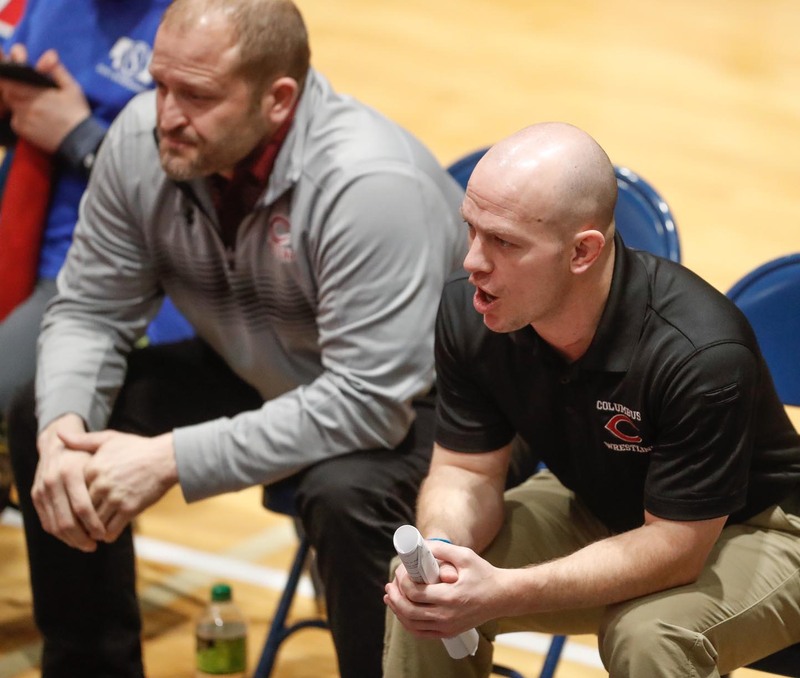 The Columbus High coach was a member of the national runner-up team in 2003 and served as a graduate assistant when the Lopers claimed a championship in 2008. “It’s kind of cool to see that stuff. The new athletic director has really upgraded this facility,” Keiswetter said of Paul Plinske, who was named director of athletics at UNK in 2013. For UNK, hosting the tournament provides an opportunity to impress more than just former Lopers. There are hundreds of high schoolers and parents also checking out the campus. Columbus High coach Adam Keiswetter, right, was among several coaches with UNK ties who brought their teams to the dual championships at UNK. He noted facility changes since his time as a Loper, including banners representing UNK’s wrestling national championships and five national runner-up performances. “It’s kind of cool to see that stuff. The new athletic director has really upgraded this facility,” Keiswetter said of Paul Plinske, who was named director of athletics at UNK in 2013. Means said the university rolls out the red carpet for all visitors, creating an enjoyable experience that resonates with students, parents, teachers and coaches. The university’s ability to bring in large events has an impact that extends beyond the campus. 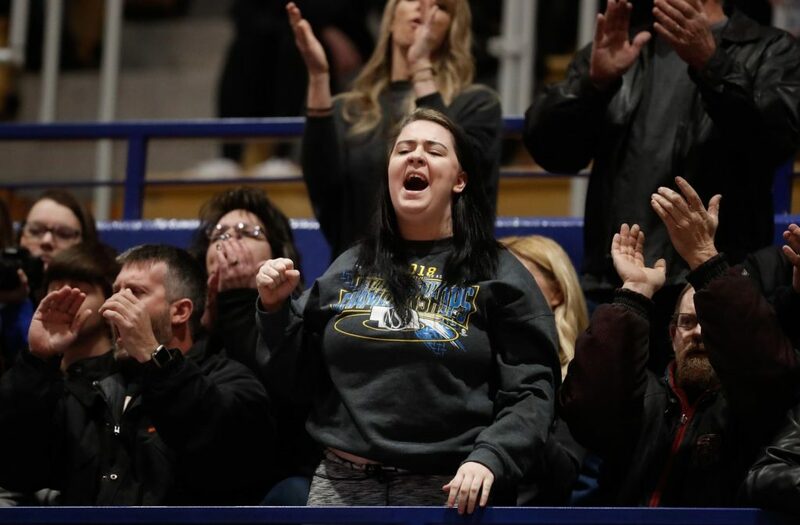 On Friday night, wrestling teams and fans filled Kearney hotels ahead of the tournament and out-of-town guests spend money at Kearney restaurants and retail businesses during their stay. Although it’s difficult to put an exact dollar amount on the impact, Kearney Visitors Bureau representatives recognize its importance. Alongside the wrestling tournament, the annual Nebraska Cattlemen’s Classic livestock show and sale wrapped up Friday at the Buffalo County Fairgrounds, the Nebraska State Reading Association hosted its annual conference last weekend at the Ramada Inn and Loper basketball teams hosted their regular-season finales Friday night. The community also plays a role in this effort, as 200 to 250 volunteers were needed for the wrestling tournament alone. Olivia Slater, a freshman at UNK and member of the Alpha Phi sorority, spent a portion of her Saturday checking tickets at the Health and Sports Center as part of a volunteer project for “Greekend.” Members of the university’s Greek community used the day to give back throughout the community. “It’s just bringing the Greek community together and showing people how united we are,” Slater said. Other UNK representatives also volunteered at the event, and students in the athletic training program got some hands-on experience treating injuries. 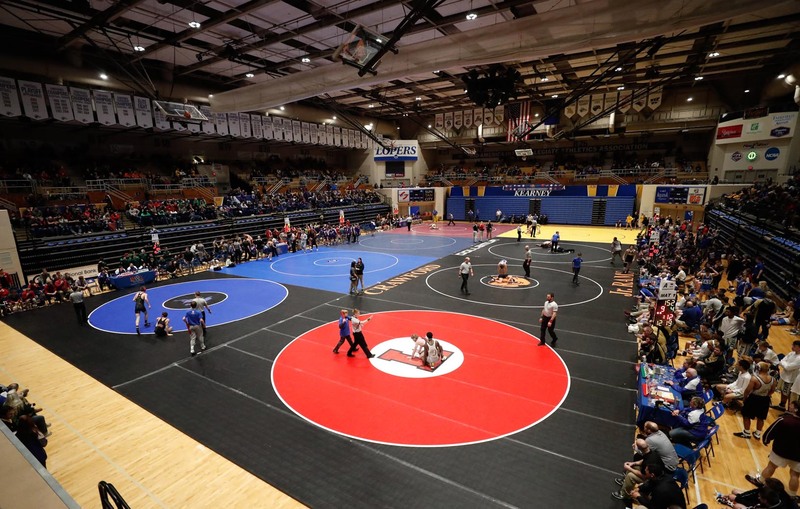 As well as the dual championships have gone at UNK, the NSAA is considering changes in an effort to grow the tournament, including moving the date and location. The NSAA’s wrestling championship committee has recommended hosting the event the week before district tournaments, and the contract with UNK expires this year. 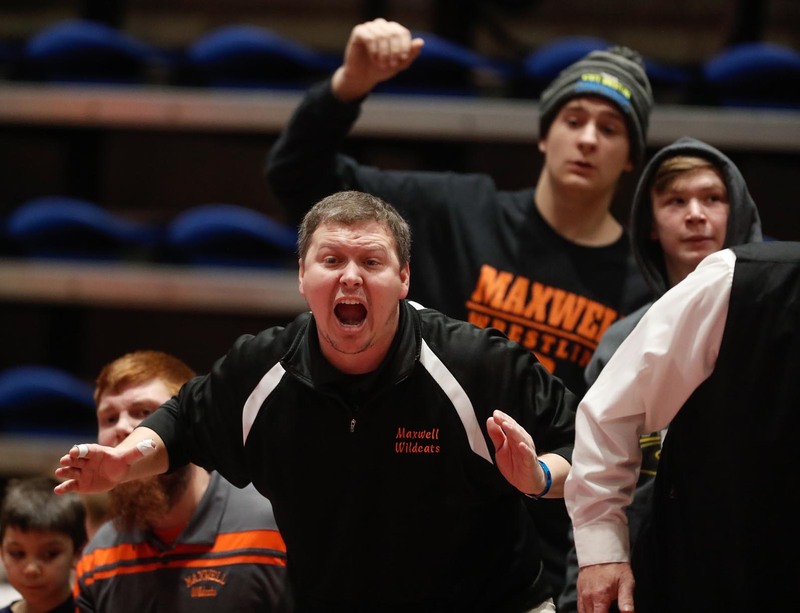 Both Keiswetter and McCurdy support a date change to increase the level of competition and fan interest, noting that the season should culminate with the individual state tournament hosted Feb. 15-17 at CenturyLink Center in Omaha. If the event remains at UNK, all the better, McCurdy said.